On our recent trip to Italy, we learned about a truly authentic and regional product heretofore unknown by the global market: Prosecco. You may think you’ve heard of Prosecco before, but in fact that sightly sweet, inoffensive bubbly beverage is a modern invention, targeted to capture a specific demographic, focus-group tested and marketed to the masses. Col Fondo, or on the sediment, Prosecco, is another animal entirely. Now, we’re no stranger to lost methods of winemaking. We’ve been working with petillant naturels (pet nat for short) from France for quite some time now. 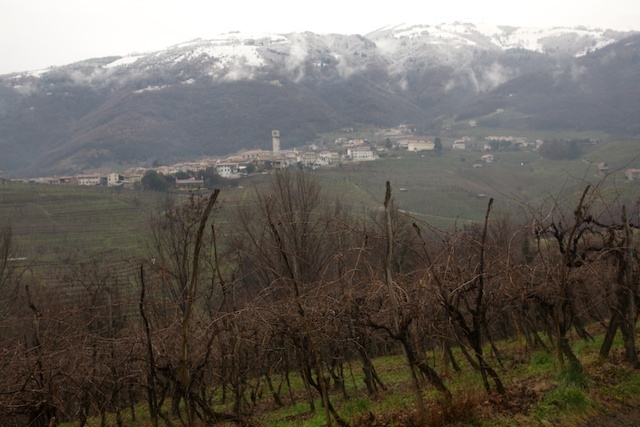 So at first when we tasted Ca’ dei Zago‘s Col Fondo Prosecco, we assumed this was a similar story, a lost method brought back by curious and experimental natural winemakers. But in fact, when you visit Valdobbiadene in the Veneto, you discover that nothing could be further from the truth. In fact, Col Fondo is in abundant supply, but 99% of it is drank locally and never leaves the region. Most of the vines in Valdobbiadene are terraced on extremely steep hills, making machine harvested impossible. Does this look to you like the kind of area that makes a mass-marketed wine? Commercial prosecco is made in the charmat method, fermentated in large, pressure sealed, generally stainless steel tanks, and the finished wine is transferred to the bottle under pressure. Made with selected yeast and toss in some sugar, and you get the product most people think of as Prosecco. Slightly sweet, clear and filtered, this is a bubbly commercial beverage. Col Fondo Prosecco, however, is initially fermented in a tank, but then transfered to the bottle about 1 degree of alcohol before it is finished fermenting. The remainder of the fermentation takes place inside the bottle, and as the yeast finishes its job, it falls to the bottom, leaving a small amount of sediment behind. Col Fondo bottles are stored standing up to leave this sediment at the bottom, and then decanted into a pitcher at serving time, reserving the last little bit of cloudy wine in the bottle, to be tasted and enjoyed separately. The flavor is light and pure, something innocent enough to be enjoyed at any occasion, with any food throughout the day. 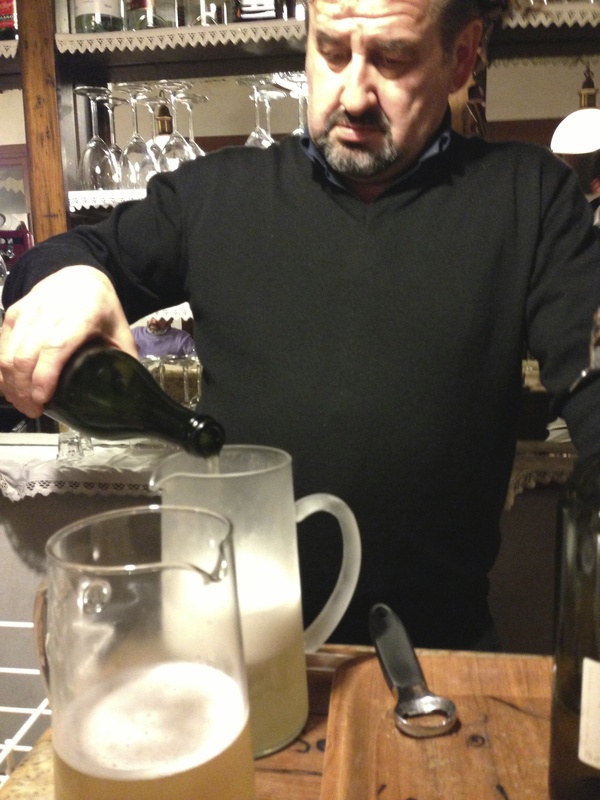 The local bartender, decanting some house-made Col Fondo before serving. Glera, the grape used in Prosecco, is a late ripening variety, that naturally finishes fermenting around 10% alcohol depending on the vintage. Most commercial Prosecco ends up around 11% alcohol, thanks to the addition of sugar and yeast. The Col Fondo from Ca’ dei Zago we are working with is a representation of the natural 10% level the grape attains on its own, with no additives whatsoever. Col Fondo Prosecco, is not some lost method, brought back through the use of arcane writings or related from stories told by grandparents. Col Fondo is in fact alive and well today in Valdobbiadene. Everywhere we went, be it Christian Zago’s great auntie’s, or the local bar in San Pietro di Barbozza, we found unlabeled Col Fondo bottles. Every family in the area that grows grapes reserves a tiny quantity for themselves and makes their own Col Fondo, before selling them to the commercial Prosecco maker. The sad fact today is that a grower can earn a lot more by selling his grapes to a big house, rather than by making his own artisanal product that reflects the history, culture and terroir of the region. As a result, Prosecco Col Fondo almost never leaves the region. The first person to make and export it outside the region, was Louis Follador of Casa Coste Piane. Christian Zago, our young winemaker, says he has a tremendous amount of respect for this pioneer who was the first to bring this style of wine around the world. The story of Col Fondo stands in stark contrast to Champagne, its bubbly counterpart to the north. In Champagne, growers struggled for years to free themselves from the tyranny of the big houses, and are now experiencing a revival of small production and new-found economic independence. In Valdobbiadene, however, the region has firmly attached itself to the production of commercial Prosecco. In fact, Champagne now struggles to fill the economic void created by this less expensive but powerful new-comer. For now, that story is one of great economic success for the region, as thirsty drinkers worldwide crave a less expensive bubbly wine. But, as we know, world-wide tastes ride trends, and always seek the next best thing. What happens if the world moves on from the commercial Prosecco style? Who knows, maybe then the Col Fondo winemakers will become the heroes of the region, as people increasingly seek out the myriad real and authentic experiences small regions have to offer.